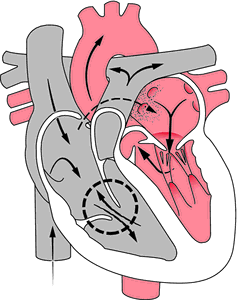 a malformation of the tricuspid valve, the septal and posterior leaflets being adherent to the wall of the right ventricle to a varying degree, producing tricuspid deficiency, and the anterior leaflet being normally attached to the annulus fibrosus; usually associated with an atrial septal defect. Ebstein's anomaly with tricuspid valve significantly displaced downward in the right ventricle; leakage occurs through the tricuspid valve back to the right atrium, and unoxygenated blood is shunted across the atrial-septal defect into the left atrium. From Betz et al., 1994.
a congenital heart defect in which the tricuspid valve is displaced downward into the right ventricle. The abnormality is often associated with right-to-left atrial shunting and Wolff-Parkinson-White syndrome. An uncommon (0.5% of all congenital heart defects) cardiac malformation, which is characterised by apical displacement of the septal and posterior tricuspid valve leaflets, with atrialisation of the right ventricle and displacement of the anterior leaflet, leading to tricuspid regurgitation of varying severity and backflow of blood into the right atrium from the right ventricle. a malformation of the tricuspid valve, usually associated with an atrial septal defect, characterized by a downward displacement of the base of the valves. Ebstein's anomaly – Review of a multifaceted congenital cardiac condition. Preoperative physiology, imaging, and management of Ebstein's anomaly of the tricuspid valve. A new reconstructive operation for Ebstein's anomaly of the tricuspid valve. The use of spinal anaesthesia in patients with Ebstein's anomaly is largely limited due to the sympathetic blockade induced precipitous fall in blood pressure that may worsen the right to left shunt. CONCLUSION: A thorough understanding of the pathophysiology of the condition is essential for the successful anaesthetic management in patients with Ebstein's anomaly and the anaesthetic technique chosen should be individualized based on the cardiac status, type of surgery, site of surgery and also the duration of surgery. Case report: Anaesthetic implications of Ebstein's anomaly. described that pregnancies with asymptomatic Ebstein's anomaly could even have normal delivery whenever they do not meet general indications for C-section. In patients with Ebstein's anomaly, arrhythmias do not represent absolute contraindication for pregnancy, however tachycardia is poorly tolerated in this congenital heart disease (8). Anaesthesia for caesarean section in a pre-eclamptic patient with Ebstein's anomaly. CONCLUSION: We conclude that the successful outcome of a patient with Ebstein's anomaly undergoing Hemithyroidectomy under General anaesthesia (G.
Surgical management of Ebstein's anomaly in the adult. Epidural analgesia for labour in a patient with Ebstein's anomaly.